The following image is a preliminary screen capture of the Gitga'at's Google Earth place names project, and part of an on-going, living community map documenting their Sm’algya̱x place-based names and stories. "The names reflect our history and traditions, our spiritual and physical connections to our territory, land and sea, as well as the seasonal rhythms by and through which we have lived and thrived for thousands of years. 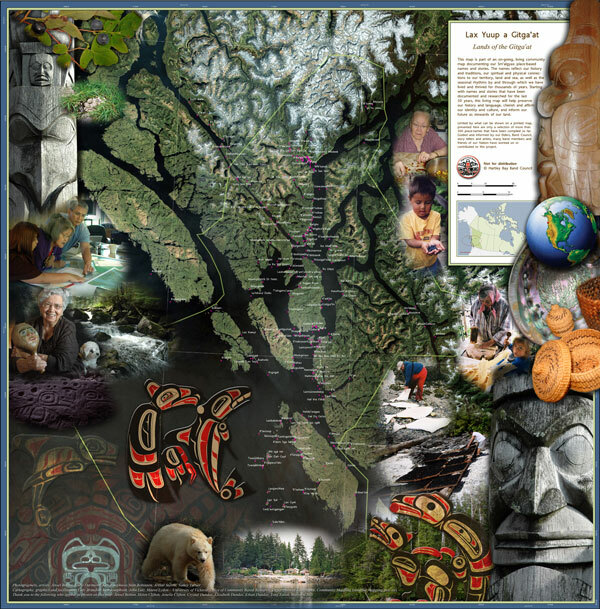 Starting with names and stories that have been documented and researched for the last 50 years, this living map will help preserve our history and language, cherish and affirm our identity and culture, and inform our future as stewards of our land". In preparation for the Enbridge Proposed Pipeline and Tanker Route Environmental Hearings, a basemap with Sm’algya̱x placenames was prepared as a poster for the elders to speak to. Below is a low resolution version of the map. Click the map for a larger version. Here's a 2011 Christmas greeting from the folks in Hartley Bay! John and Sylvan Lutz, Maeve Lydon and Ken Josephson just came back from a visit to Hartley Bay. More information about the project will be posted shortly. In the mean time Here's a slide show of the adventure. A special thanks to our partners and friends in Hartley Bay! Here is a recent video from Raincoast Conservation that gives us some background on the Great Bear Rainforest, the proposed Enbridge pipeline and tanker route and some of the potential impacts of the proposal on our coast. 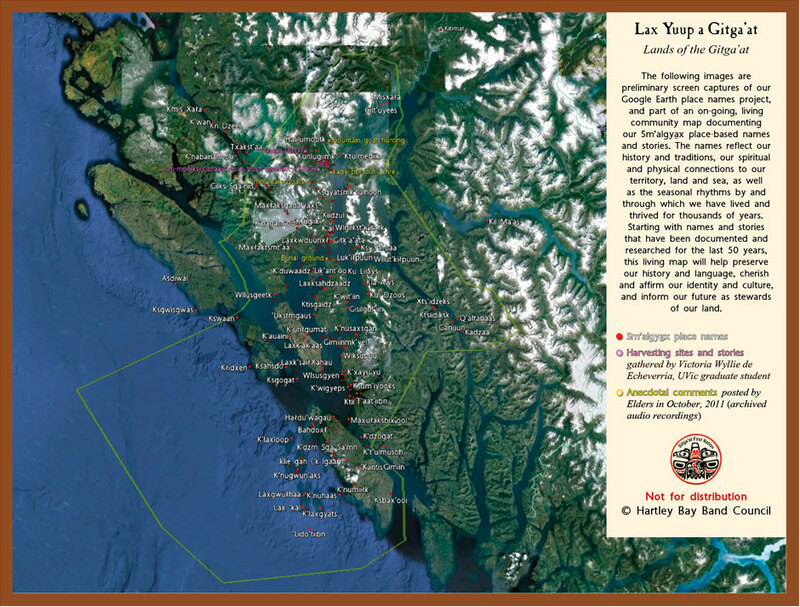 In the Spring of 2009, friends Chris Rhodes and Michael Reid, decided that they were going to kayak BC’s coast. The trip was motivated by their fear of becoming numb to some of the issues facing the more remote regions of the coast. The expedition spanned roughly 700 kilometres and took them 40-days to complete. Along the way they stopped in at various research stations and First Nations communities to learn more about the issues from those that have to cope with them first hand. They decided to film their journey in hopes that it would connect people to not just the issues, but the places and the people most affected. Uncomfortably Numb is a film about their journey. This film follows the International League of Conservation Photographers as they team up with the Gitga'at Nation of British Columbia to document the Great Bear Rainforest before an oil pipeline changes it forever. Go to pacificwild.org to help protect this beautiful place. SPOIL from EP Films on Vimeo. ‘Tipping Barrels’ is a unique combination of surfing and environmental journalism that follows surfers Arran and Reid Jackson on a trip into the heart of the Great Bear Rainforest, where they learn more about the region and the issues confronting it. Set sail with Raincoast Conservation Foundation, Patagonia and Woodshed Films for an exploratory surf trip along British Columbia’s unspoiled west coast. While searching for waves, the crew documents what would be threatened if the Northern Gateway tar sands oil pipeline is built. More info at raincoast.org. Help Make Mosaics with your Castings!